Henllys Ganol is a farm located on the outskirts of Llanbedrog and caters for touring caravans, there are hook ups and a toilet & shower block available. 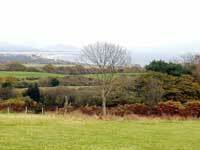 A friendly site with magnificent views across Cardigan Bay and the Rival Mountains. We also have TWO Self Catering Static Caravans - Each one Sleeps 4 - see our Static Caravan page or use the navigation options available to see more details of these. The site is conveniently situated in Llanbedrog within walking distance of Llanbedrog beach, Plas Glyn-y-Weddw - Art Gallery, The Ship public house, Glyn-y-Weddw Arms public house, the local chemist (run by Jim's wife Helena) and a Londis convenience shop. To contact us either write to the address shown above or call us on our landline or mobile. we look forward to offering you a big CROESO - WELSH WELCOME. © 2003 - 2012 - Henllys Ganol - Jim Taylor - All rights reserved worldwide.